QuickBooks Capital is reinventing small business lending. Explore small business loans to grow your business. Find the small business loan your business needs to thrive. With QuickBooks Capital, we use the financial data you already track in QuickBooks to help you apply for a small business loan. We look at open invoices, the cash flow forecast, sales trends, profitability over time, and hundreds of other data points to help you find the right small business loan offer. We pre-fill your loan application with information from your QuickBooks account, making the business loan application process fast and easy. We look at a variety of factors to see if you qualify for a business loan, including past business history, use of QuickBooks, annual revenue, personal and business credit history, and current liabilities. Once you apply for a small business loan, we won’t keep you waiting. You’ll usually hear from us within 2-3 business days. If your business loan is approved, you can choose the amount you want to receive up to our maximum offer. Then, we deposit the loan amount directly into your business bank account in about 2 days, though many of our partners will deposit funds into your bank account the same day. When you apply for a small business loan through QuickBooks Capital, your application is sent to our trusted partners. For a short term working capital loan, QuickBooks Capital is the lender. For an additional term loan, line of credit, invoice financing, or an SBA loan, we work with a set of trusted partners. We work hard to provide you with financing options based on your unique business needs. With QuickBooks Capital, there are no origination fees, no prepayment penalties, and no surprises. We work with financing partners that are committed to providing transparent and competitive rates. You’ll always know upfront how much it costs to access QuickBooks Capital loans. Compare rates on a wide range of options from our partners without affecting your credit score. We do a soft pull of your personal credit history when you apply for a small business loan, and a soft pull won’t affect your credit. We look at the personal credit of the business owners because our business loans are personally guaranteed, unlike secured loans which require collateral. With QuickBooks Capital, interest rates are based on business and credit performance. You’ll know the borrowing cost for all types of loans upfront and there are no hidden fees. We are committed to providing transparent and competitive interest rates. There is no need to schedule or send in loan payments. We automatically debit weekly ACH payments from your business bank account and record the transaction in QuickBooks. Plus, we don’t believe in prepayment penalties. If you’re able to, you can pay off your loan early to save on interest costs. 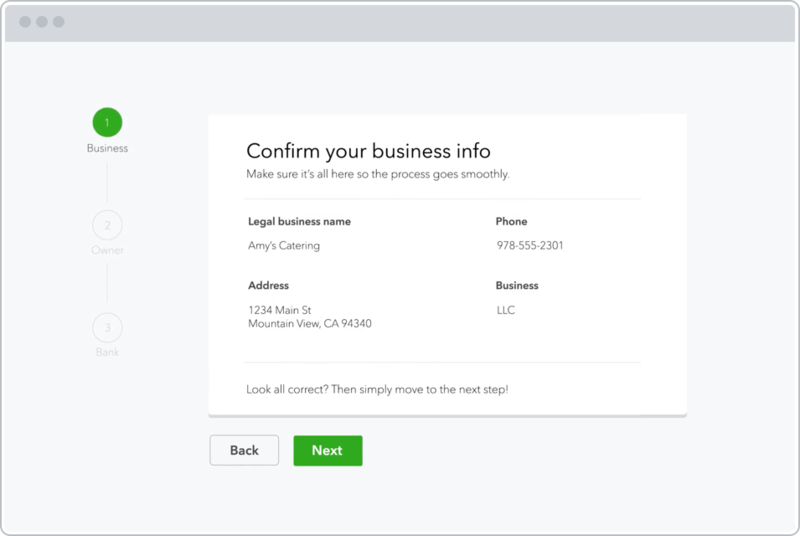 Keep track of your payment history and progress toward paying off your small business loan right in QuickBooks. We make it easy to access the details of your loan, see how much you’ve paid off and what you still owe, manage your auto-payment settings, and even set up a one-time payment. If you want to borrow again, we’ll use this loan payment history as an input when finding your next small business loan. Exploring all available funding options and understanding how a loan will impact your immediate and long-term bottom line is critical. Learn how to evaluate financing options for your business. Having a clear-cut idea about the loan and its purpose for your business are factors a lender will look at when considering your loan application. Get tips for applying for a small business loan. Given the difficulty of borrowing capital from banks, some small business owners are turning to friends and family for loans. If you decide to go this route, here are some tips for doing so. One of the biggest challenges that small business owners face is getting access to the funds they need to grow. This is why we are excited about launch of QuickBooks Capital. As the world’s largest small business ecosystem, we are uniquely positioned to help small businesses find the financing they need. Eligible QuickBooks customers can leverage their financial data to take advantage of business financing offers. We’re proud to say we’ve been able to get credit into the hands of previously underserved small businesses – 60% of which weren’t likely get a loan elsewhere. Which banks give small business loans? We partner with a list of trusted banks and financial institutions to provide small business loans via QuickBooks Capital. If you apply for short term working capital, QuickBooks Capital is the lender. QuickBooks Capital is a service offered by Intuit Financing Inc. If you’re looking for additional term loans, lines of credit, invoice financing, or SBA loans, we work with a set of trusted partners who offer competitive rates. After you apply for a loan, we will show you the best offers to choose from and which financial institutions those offers are from. Do small business loans affect personal credit? No. We do a soft pull of your personal credit history when you apply for financing. A soft pull won’t affect your credit score. However, if we have an offer for you, we’ll need to do a hard pull of your personal credit before the final approval. We’ll get your consent before we do that. A hard pull can affect your credit score. Do small business loans require a personal guarantee? Yes. Your personal credit score must be 580 or higher to be considered for a QuickBooks Capital offer. We look at personal credit because our business loans are personally guaranteed, unlike secured loans which require collateral. If your business is unable to repay for any reason, we need to know that you personally can cover the obligation. How is QuickBooks Capital better able to help small businesses find financing? As the world’s largest small business ecosystem, we are uniquely positioned to help small businesses get access to the funds they need to grow and smooth cash flow bumps. We negotiate with financing partners to get you competitive rates, and we make it easier by providing your information to the partner you choose, saving you time. If we can’t match you with an offer from a financing partner, don’t be discouraged. You can work with these and other financing partners directly.